We present an Online Random Ferns (ORFs) classifier that progressively learns and builds enhanced models of object appearances. During the learning process, we allow the human intervention to assist the classifier and discard false positive training samples. The amount of human intervention is minimized and integrated within the online learning, such that in a few seconds, complex object appearances can be learned. After the assisted learning stage, the classifier is able to detect the object under severe changing conditions. The system runs at a few frames per second, and has been validated for face and object detection tasks on a mobile robot platform. We show that with minimal human assistance we are able to build a detector robust to viewpoint changes, partial occlusions, varying lighting and cluttered backgrounds. We present an Online Random Ferns (ORFs) classifier that progressively learns and builds enhanced models of object appearances. During the learning process, we allow the human intervention to assist the classifier and discard false positive training samples. The amount of human intervention is minimized and integrated within the online learning, such that in a few seconds, complex object appearances can be learned. After the assisted learning stage, the classifier is able to detect the object under severe changing conditions. The system runs at a few frames per second, and has been validated for face and object detection tasks on a mobile robot platform. We show that with minimal human assistance we are able to build a detector robust to viewpoint changes, partial occlusions, varying lighting and cluttered backgrounds. 2012 ICPR Org Committee. Villamizar, M.A. [et al.]. 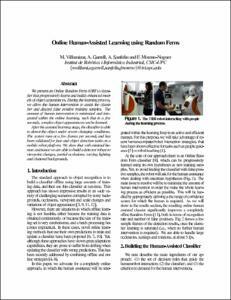 Online human-assisted learning using random ferns. A: International Conference on Pattern Recognition. "Proceedings of International Conference on Pattern Recognition". Tsukuba Science City: 2012, p. 2821-2824.